The Trump brothers were photographed holding dead animals on safari in 2012. Donald Trump Jr. caused an uproar among some when pictures surfaced of him holding the tail of a dead elephant after a big-game hunt in Africa years ago. Now, new policy changes proposed by his father’s administration may allow Americans to bring the carcasses of elephants and lions killed in Zimbabwe and Zambia back to the U.S. The importing of so-called hunting trophies was banned by former President Obama in 2014, but the Fish and Wildlife Service announced that it will allow Americans to bring back elephant and lion trophies. Fish and Wildlife officials began issuing permits for lion trophies on Oct. 20, and had been ready to issue permits for elephant trophies on Friday. The elephant trophy ban will remain, at least for now, as Trump tweeted late Friday the administration would further review the facts. The African lion population has decreased 42 percent in the past 20 years, according to the African Wildlife Foundation. During the press briefing Friday, White House Press Secretary Sarah Sanders said that the change in policy stems from a study that was initiated during the Obama administration. Sanders noted the ban on imported ivory remains in place. Neither of Trump's sons have spoken about the policy changes yet, but both Donald Trump Jr. and President Trump have publicly spoken about their family’s hunting history in the past. Back in 2012, years before their father ran for president, photos surfaced of Donald Trump Jr. and Eric Trump's hunting trip to Zimbabwe. Photos released by the safari company at the time, which were later published on TMZ and elsewhere, showed the brothers posing next to various dead animals that were killed as part of their hunt. Donald Trump Jr. was 34 years old at the time, and Eric Trump was 28. Various photos show the brothers flanking a crocodile hanging from a tree, smiling behind the horns of a killed waterbuck, and standing together as Eric held a dead leopard. Donald Trump Jr. was pictured sitting next to a dead buffalo while holding a gun and wearing an ammunition belt, and Eric Trump can be seen sitting on one of the dead animals with guns resting on its horns. The Trump brothers were not pictured with any dead lions in 2012, but Donald Trump Jr. was pictured next to a dead elephant while holding its severed tail. A spokesperson for the Trump sons did not immediately return ABC News’ request for comment on the recent policy change. It remains unclear if the brothers brought back any animal trophies from their safari trip, as it was legal to do so at the time. 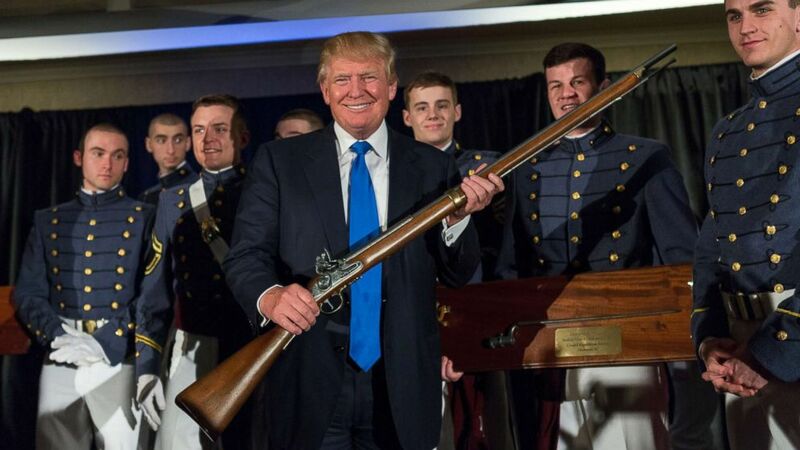 (Richard Ellis/Getty Images) Reality TV host and New York real estate mogul Donald Trump holds up a replica flintlock rifle awarded him by cadets during the Republican Society Patriot Dinner at the Citadel Military College, Feb. 22, 2015 in Charleston, S.C.
Donald Trump Jr. has spoken about the 2012 trip in the past. In a 2012 interview with a Forbes contributor, Donald Jr. reportedly told him that it was African tradition to cut off an elephant's tail and use its hair to make bracelets, and that it is seen as a sign of respect for the animal. “We have the utmost respect for nature and have always hunted in accordance with local laws and regulations. In addition, all meat was donated to local villagers who were incredibly grateful. We love traveling and being in the woods—at the end of the day, we are outdoorsmen at heart,” the statement read. That didn’t stop critics from going after Donald Trump Jr. on Twitter, and he responded in kind. “I AM A HUNTER I don't hide from that,” he wrote in one tweet to a critic. I AM A HUNTER I don't hide from that "@Fashion_life01: Jr what do you think of the controversy surrounding a pic where ure shown hunting? “Not a pr move I didn't give the pics but I have no shame about them either. I HUNT & EAT game,” he wrote in another. More recently, Donald Trump Jr. has shared a number of photos from domestic hunting trips, including one in Montana earlier this month. He also shared a photo from a bow hunting trip in the Yukon “earlier this fall,” and went pheasant hunting in Iowa with Rep. Steve King (R-Iowa) in October. President Trump commented on his sons’ love of hunting to TMZ after the photos were released in 2012. At the time, Donald Trump defended his sons but acknowledged he felt differently about hunting. “My sons love hunting. They're hunters and they've become good at it. I am not a believer in hunting and I'm surprised they like it,” Trump told TMZ at the time. “I know that anything they did was 100 percent okay in terms of the hunting community,” Trump added to TMZ. (Derek Davis/Portland Press Herald via Getty Images) Donald Trump Jr. speaks to supporters of his father, presidential candidate Donald Trump, at Howell's Gun Shop in Gray, Oct. 25, 2016. The brothers said their interest in hunting came from Ivana Trump's father. “Our maternal grandfather was Czechoslovakian. When we were young, he would have us to his place in Czechoslovakia for a month or more during summers…He loved to hunt and fish and taught us how,” Donald Trump Jr. told Forbes in 2012. But Ivana Trump herself has spoken out about her sons' hunting, writing in her book published just last month, “Raising Trump,” that she was "not fond of" it. “I don’t object to their going to Patagonia to shoot birds. There are a million of them there, enough to spare," Ivana Trump wrote. "But why go to Zimbabwe to shoot Bambi and Dumbo? I don’t blame people for giving them a hard time about it." 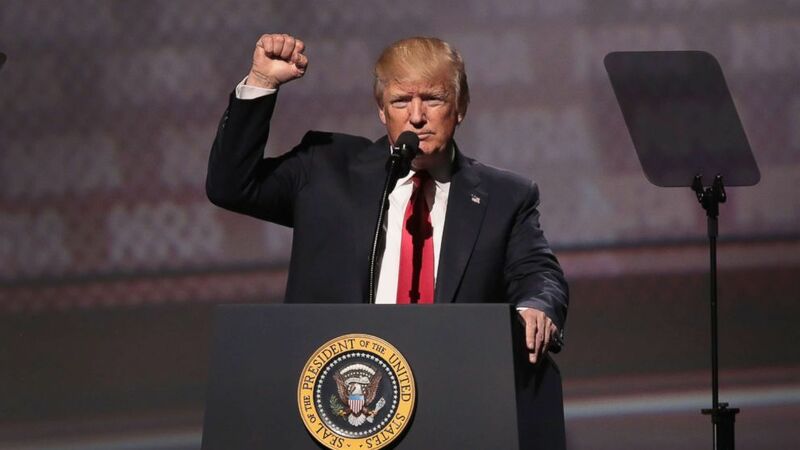 While President Trump may not “understand” his sons’ interest in hunting, he has referenced it when appealing to gun rights supporters both during the campaign and since he has taken office. A month before Donald Trump announced his candidacy, he tweeted about his sons’ ties to the National Rifle Association. “My two sons, Eric & Don, have long been expert hunters & marksmen @NRA. They go on safaris & give animals to the poor & starving villagers!” he tweeted. My two sons, Eric & Don, have long been expert hunters & marksmen @NRA. They go on safaris & give animals to the poor & starving villagers! And while the president never talks about hunting himself, he said he does own a gun. In his 2015 book, Trump wrote that he "owns guns. Fortunately, I have never had to use." According to publicly accessible records, President Trump has had a concealed weapons permit since 2010. (Scott Olson/Getty Images) President Donald Trump speaks at the NRA-ILA's Leadership Forum at the 146th NRA Annual Meetings & Exhibits, April 28, 2017 in Atlanta. “I'm a member of the NRA. My sons, Don and Eric, are members of the NRA for a long time. They're hunters. They're great members of the NRA,” Trump said during an MSNBC town hall event in February 2016. 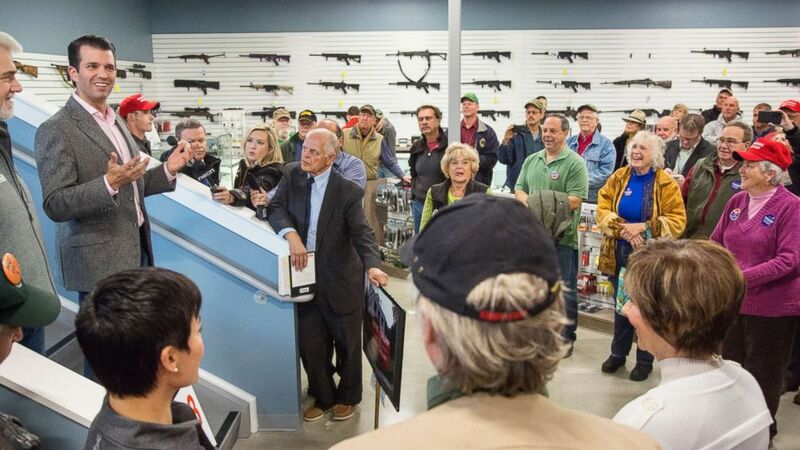 He has specifically mentioned his sons’ NRA membership in speeches he has given to the gun rights group, both as a candidate in 2016 and as president earlier this year. “I can tell you, both sons, they love the outdoors. Frankly, I think they love the outdoors more than they love, by a long shot, Fifth Avenue,” he said in his April 2017 speech to the NRA.